Known locally as ‘The Rock’, M.M. 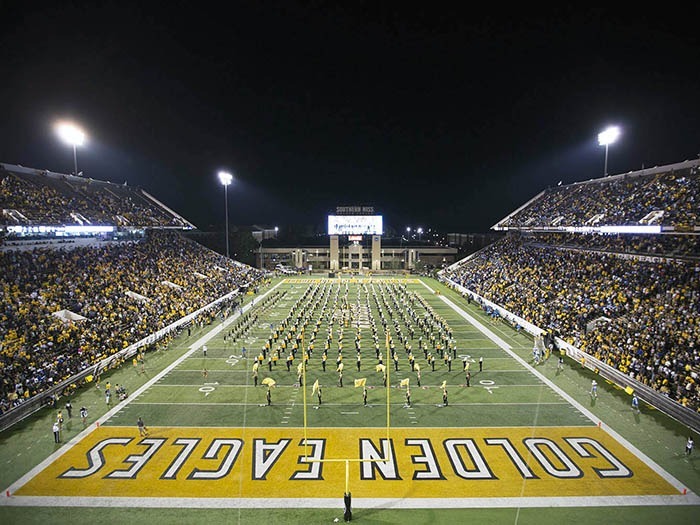 Roberts Stadium is home to the University of Southern Mississippi’s Golden Eagles football team. It originally opened in 1932 with 4,000 seats and has since expanded to hold 36,000-plus rambunctious Southern Miss fans. Its most recent expansion happened a decade ago, and although the expanded infrastructure and seating is in great shape, the sound reinforcement system that went in didn’t fare as well. After an overhaul installed by AV integration firm Sound & Communications, of Flowood, Mississippi, M.M. Roberts Stadium now commands a full Danley Sound Labs loudspeaker, subwoofer, and amplifier/DSP system.